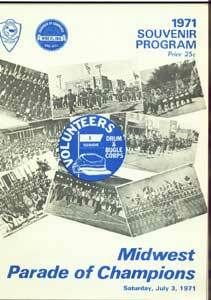 Many drum corps fans know about the creation of the Midwest Combine in 1971 and how the success of the one-year organization helped pave the way for Drum Corps International the following year. What most fans don't know is the remarkable story behind the combine's first contest and the severe risk of failure that hung over one man and his willingness to stick his neck out to give the combine a chance. That man was Bob Hoehn, Sr., a drum corps fan in the Chicago area. His son, Bob Hoehn, Jr., was corps manager for the Cavaliers at the time. Bob Jr. would later go on to help found Spirit of Atlanta. Back in the summer of 1970, Don Warren, founder and president of the Cavaliers, had a chance encounter with Jim Jones, his counterpart with the Troopers. The encounter took place in a stadium washroom in Delevan, Wis. As Warren has related, he mentioned to Jones that they should think about making drum corps independent from the veterans' organizations that ran the national championships. He believed that the corps should think about running their own championships, keeping the bulk of the proceeds for their own use. Jones thought a few seconds and replied with something on the order of, "Well, we do have the product." From that encounter, the idea for the Midwest Combine was born. The organization would start with just a few corps and would set its own rules independent of the Veterans of Foreign Wars and the American Legion. Five corps were approached to be part of the new venture: The Cavaliers, Troopers, Blue Stars, Madison Scouts and Santa Clara Vanguard. The corps agreed to stick together and to approach show promoters with the prospect of having to take all five of the units in a package deal. Earnings would be more fairly spread around the corps than the veterans' organizations approach of rewarding just the top units. Word of the formation of the combine made it out East, and in reaction to the news, five eastern corps created their own similar venture, the United Organization of Junior Corps. These corps included the 27th Lancers, Garfield Cadets, Boston Crusaders, Blessed Sacrament Golden Knights and Blue Rock. If anyone out there has any interesting stories about the UOJC and the sacrifices taken by these corps or early show promoters and judges, I'd love to hear from you. There was much fear and trepidation among the old power structure about what the combine would mean to the future of the activity. So much so that when Don Warren attended a meeting of the influential Illinois Drum and Bugle Corps Association in order to explain what the combine was trying to do, he was picked up in his chair and unceremoniously carried outside the meeting hall. Show promoters were told that if they hosted a combine show, they would never get a drum corps show again once the combine inevitably failed. The service organizations and circuits informed the judges that if they judged such shows, they would never again receive judging assignments. Against that aura of mistrust and threats stepped Bob Hoehn, Sr., becoming one of drum corps' bravest and largely unsung heroes. Don Warren approached Bob Hoehn, Sr. and asked him to sponsor the first show. The combine was set up on the principal of guaranteed appearance fees, which were considered steep by the then-current standards. According to Paul Milano (who first sent me information about this story), it was not certain that a contest at a typical high school stadium could cover these fees. Paul added, "Bob Sr. did the math and realized he was taking a large risk. Not only that, but to secure the contract, he had to take out a note on his home to ensure payments to the corps." Bob Hoehn Jr. remembers being at the meeting in Indianapolis when the combine was set up. "As soon as I got back to Chicago, I talked with my dad and we decided to sponsor one of the shows. I phoned Don and secured the date of Saturday, July 3. My dad had started a corps in Wheeling called the First Illinois Volunteers, which was going to be a feeder corps for the Cavaliers. We contacted the Wheeling Chamber of Commerce and the Wheeling Jaycees to sponsor each of the corps in competition. I think we got $250 per corps to march in a parade and we got permission to use Wheeling High School for a show site. The Jaycees had their Carnival planned for the weekend of July 4, so everything looked OK. "The first obstacle was getting judges. My dad spoke to Don Pesceone of the Central States Judging Association, and was told they could not judge any show that was part of the combine because of pressures from the VFW and American Legion (Pesceone later became executive director of Drum Corps International). I called Don Warren and he spoke to Pesceone. The next day, CSJA agreed to judge the show. Our next hurdle was to secure the $7,500 it took to run the show. We had $1,250 from the Jaycees and the Chamber would pick up the housing for the judges. My dad and I took out a note for $5,000." Milano remembers how difficult it was to get judges for the show. Don Angelica had put together one slate, but shortly before the show, the judges backed out, convinced they would not judge again, a "hobby" they truly enjoyed. He remembers that Pesceone, "an M&M judge, was asked to consider risking his future judging opportunities to help these drum corps get a fair shake." (For those of you who are kind of new to drum corps, marching and maneuvering is what the visual caption used to be known as.) Milano further states, "Remember, back then, if 30,000 people were in the stands for VFW Finals, the corps went home with a collective $5,000 or so, had zero input on the rules, and zero input on most of the judging credentials." The lineup for the first combine show included all the combine members: The Cavaliers, Troopers, Santa Clara Vanguard, Madison Scouts and Blue Stars. Also scheduled to attend were the DesPlaines Vanguard and Anaheim Kingsmen, the Dundee Scots H.S. Band from West Dundee, Ill. (the top marching band in Illinois, under the direction of Doyle Heffron) and the Cornetts Drill Team, a National Champion drill team from Arlington Heights, Ill., headed by George and Lynn Lindstrom (who went on to found Winter Guard International). Bob Jr. continues, "Finally, the day of the show arrives and we had only sold 150 tickets. Much of the drum corps community was saying it was going to boycott the combine. Anaheim Kingsmen pulled out of the show and were replaced by the Belleville Black Knights, who agreed to appear for free. The Des Plaines Vanguard also was appearing free of charge just to be in show." As Milano relates, "In those days, there wasn't anything in the way of "marketing" a local show. All sales were essentially walk-ups or day-of-event sales. And it rained most of the day. Less than an hour before the show, most of the stands were virtually empty, and word of mouth rumors had spread that no judges were coming and that the corps had pulled out. There would be no show." Bob Jr. confirms the gloom. "The show began at 7 p.m., and at 4 p.m. I figured that my family would probably be homeless within a week. Tickets were $7 and we needed to sell over a 1,000 to break even. Things were looking bleak." But then something magical happened. "At 6 p.m., the area was like a rock concert. The police were running around like chickens with their heads cut off because of the traffic. The crowd at the gate was already over 1,000 and ready to enter the stadium. Seats were general admission so they were going to run for the 50-yard line. "By 6:30, the front sideline seats were sold out. By 7:00, the back sideline seats were sold out and the box office started selling seats on the grass for $3. When announcer Tom Days and contest director Bob Briske started the show, there were over 4,000 people crowded into this stadium." Milano agrees. "With the skies clearing, Bob Sr. stood at the gate with his wife, Doris, selling tickets next to him. Soon, the parking lot became a swarm of cars. Why everyone waited until the last minute I'll never know, but in all seriousness the stands went from almost totally empty 45 minutes before show time to the largest standing-room-only high school stadium crowd anyone had every witnessed up to that point. Bob Sr. and Doris Hoehn had not lost their house that night." Bob Jr. remembers the show-ending profit as being $21,000. He gave his share of the profits to the Cavaliers and his dad gave his to the First Illinois Volunteers. He adds, "The show itself was spectacular. The "Circus Show" of the Cavaliers, the "Alice in Wonderland" show of Madison, the classical show of Santa Clara, the Western show of Troopers and the popular songs of Blue Stars had the crowd in a frenzy (the Cavaliers remained undefeated that night). This was a night of nights and the beginning of what has become DCI." "We took a chance on an idea and that idea paid off both financially and spiritually, because that night was magic. The next combine shows in Dubuque, Iowa and Michigan City, Ind., also were magic. Six years later, when I started Spirit of Atlanta along with Freddy Martin, we picked Wheeling as our first show, another magical night." Milano recounts, "Many people can be thanked (or cursed, depending upon your point of view, I suppose) for the success of the combine, which ultimately became DCI. In my mind, one of the most 'unsung heroes' of our beloved activity is Bob Hoehn, Sr. "Bob Sr. was old-time drum corps. He marched in senior corps in the 1940s and ran a senior corps in Miami in the 1950s. He simply wanted drum corps to have control of its own destiny. He took a huge personal risk that no one else was willing to do. "The success of the Wheeling show proved to other show sponsors, other corps, and other judges, that there would, in fact, be life after VFW and American Legion. "Bob Sr. died several years ago, followed shortly afterward by his wife of 50 years, Doris. Bob Hoehn Jr. is still an active drum corps volunteer (most recently with Spirit from JSU), having spent more than 50 years of his life dedicated to helping young people experience the same joys he and his father shared. "A tip of the hat to Bob Hoehn, Sr., my 'adopted' father and dear, dear friend." Michael Boo has been involved with drum and bugle corps since 1975, when he marched his first of three seasons with the Cavaliers.